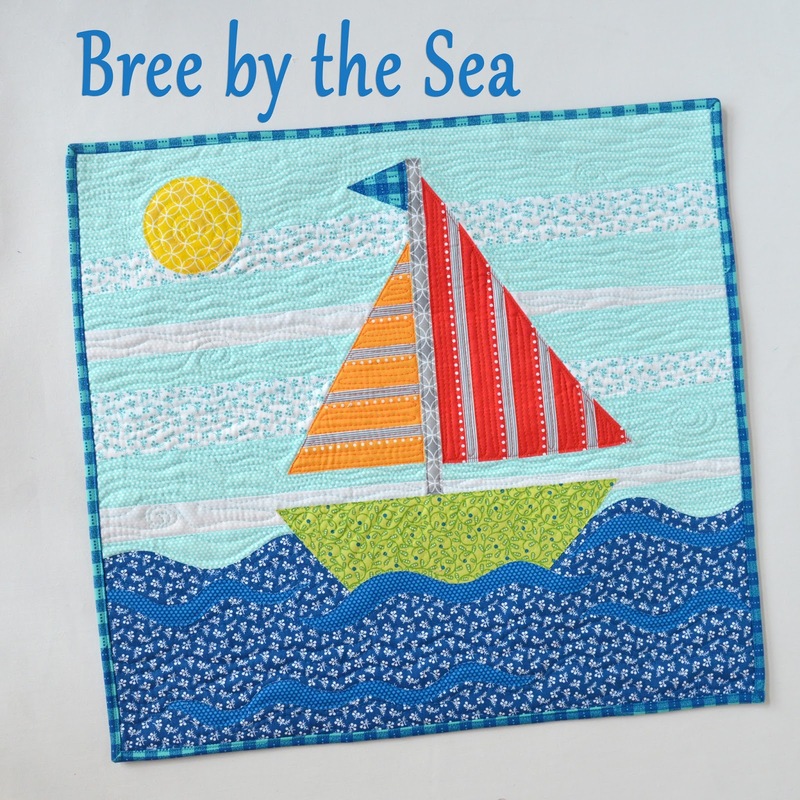 The bright and cheery colors of Bree fit beautifully with these sunny August days! With so many aquas and navies in the collection, a sailboat wall hanging seemed like the perfect seasonal project. 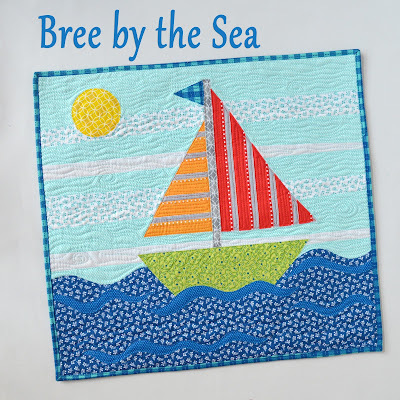 The Bree by the Sea wall hanging combines an improv-pieced background with applique--two fun techniques to play with! 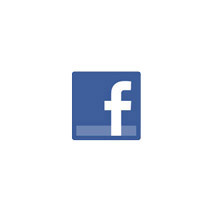 Note: Click here to download the template pages. (2) 21" long strips, ranging in width from 1-1/2" to 2-1/2"
*Trace template pieces onto the paper side of fusible web and cut out loosely around each shape. 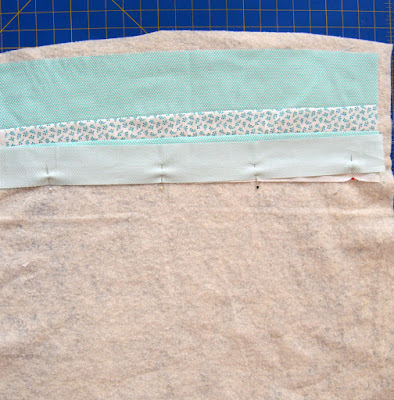 Fuse to the wrong side of indicated fabric and cut out on the drawn lines. Note: Piecing the sky uses a relaxed improv method to create a strippy, slightly angled sky. Your sky may look different based on strip width or angles of the strips (i.e. you may need more or fewer strips). Follow the directions below and continue piecing sky strips to cover approximately 16" of the batting, from the top down. 1. 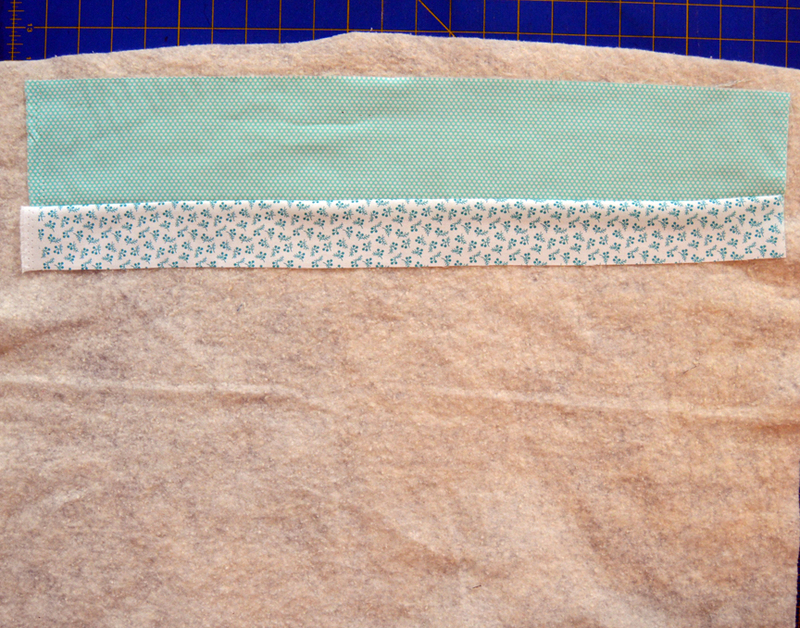 Position a wide strip of aqua dot right side up near the top edge of the binding. Position an aqua berry on white strip on top, right sides facing, angling it slightly. 2. Stitch along the raw edge, following the angle of the white strip, and press open. 3. 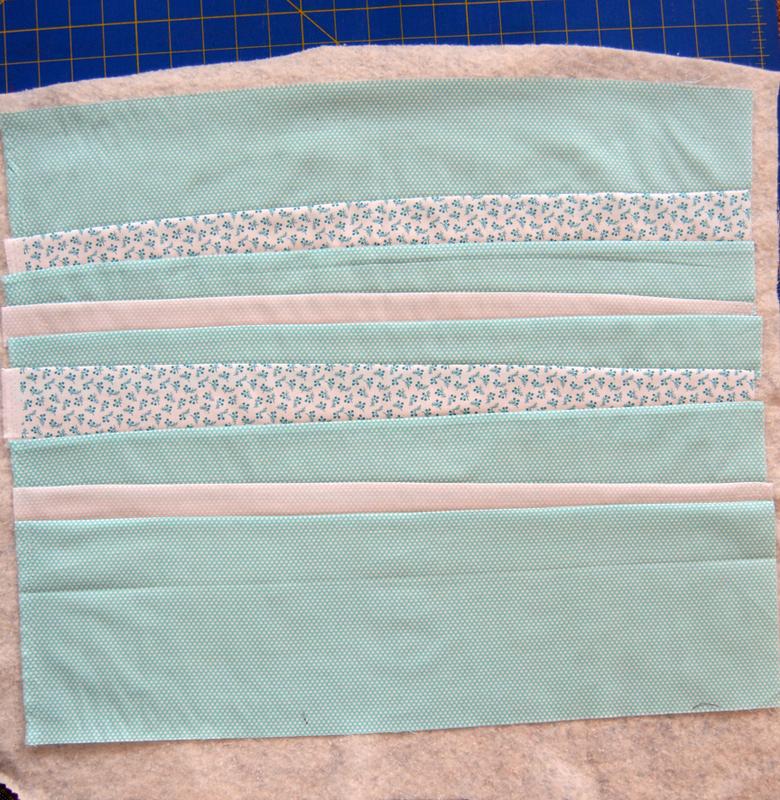 Continue adding strips, varying colors and widths, and changing the angle of each new strip. 5. Position the water fusible shape on the wrong side of the white berries on navy strip so the wavy edge is near the top edge of the strip. Fuse in place and cut out on the wavy line. Position on the background as desired, trim aqua dot strip if needed, and then fuse the water in place. For reference, our sky section measures about 14" to the water's edge in this photo, the water section measures approximately 9". 6. 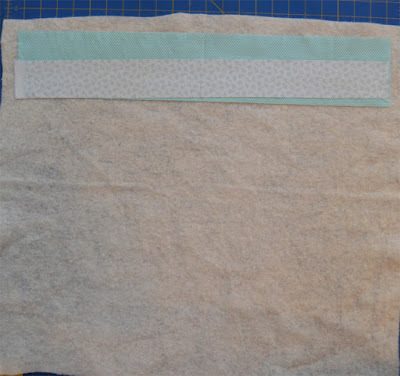 Apply fusible web to the wrong side of the 1-1/2" x 12-1/2" dot circle gray strip. From this fused strip, cut out a 1/2" x 11" piece for the mast. 7. Continue adding applique pieces to the background. Lay out the pieces before fusing in place; you may need to trim the mast (tuck the end under the boat as well). When you're satisfied with placement, fuse in place. 8. Fuse the five navy dot waves to the water, making sure wave #1 covers the bottom edge of the boat. Use the photo below to help with suggested placement. 9. If desired, machine stitch the appliqued pieces to secure (We did this as part of the quilting process.) 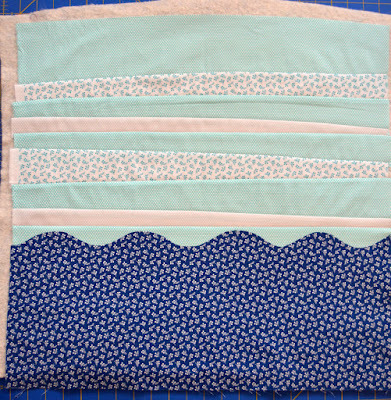 Layer the quilt top (which already includes batting) on the backing. 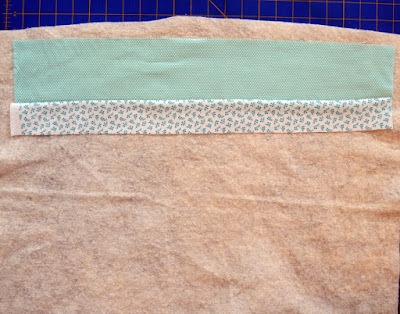 Trim batting to approximately 1" past quilt top edges for easier handling. 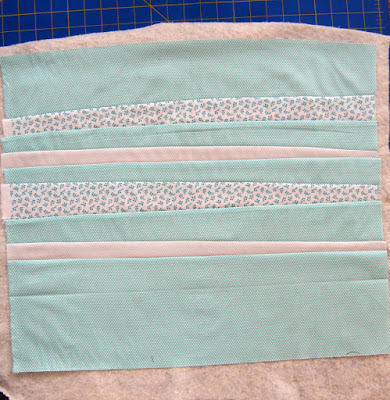 Machine quilt as desired, outlining applique shapes if you haven't already secured them. 10. 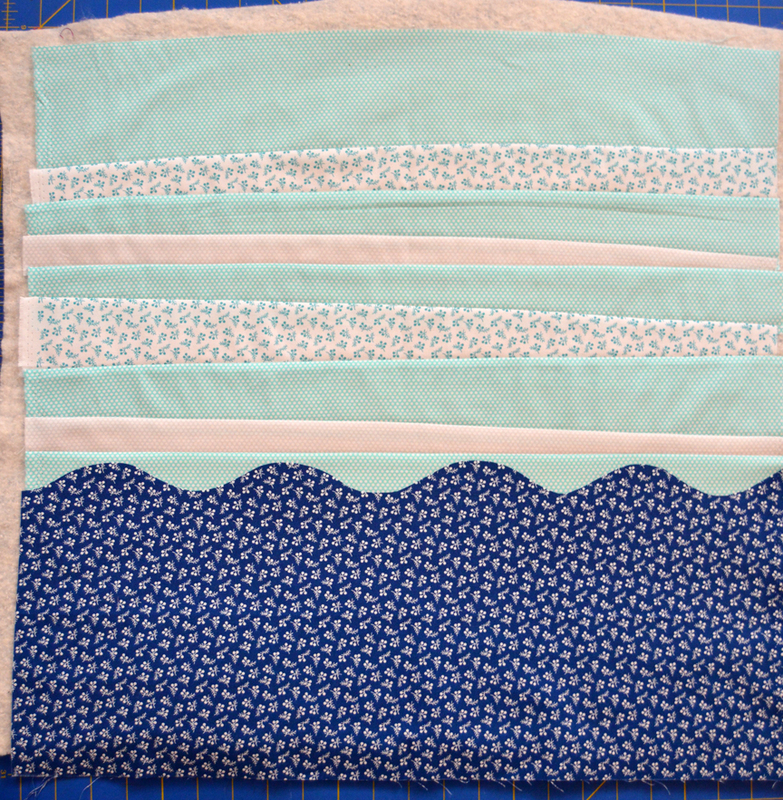 Square up the quilt; ours measures 18-1/2" x 20" (yours may vary slightly--center your design and make sure there's at least 1" background extending past all appliques except waves). 11. Sew the (5) 2-1/4" x 21" navy/aqua check binding strips short ends together into a long strip and bind as desired. Enjoy! For a chance to win a bundle of Bree fabrics, leave a comment below letting us know your favorite summer activity. Giveaway is open through Monday, August 14th at 11:59 pm EDT. What a fun wall hanging! My favorite summer activity is working in the yard. Thanks for the chance to win this fun fabric! Such an adorable wall hanging!!! Love it! My fav activity is camping in the summer!!! - especially up in the mountains where it is cool!!! Wow! The wall hanging is sooo cute. It would be perfect for a boys room. During the Summer, we have lots of festivals in and around our neighborhood. I love to go to these and see what's new. Thank you for the giveaways. That is so sweet. I love the pieced sky. Is it above 80 degree's - I'm in the Pool! I like taking the grandkids for a picnic at the park. My favorite summer activity is waiting for winter to arrive! LOL! So cute! I love being at the pool or the beach with my kids! Under a shade tree with a book. 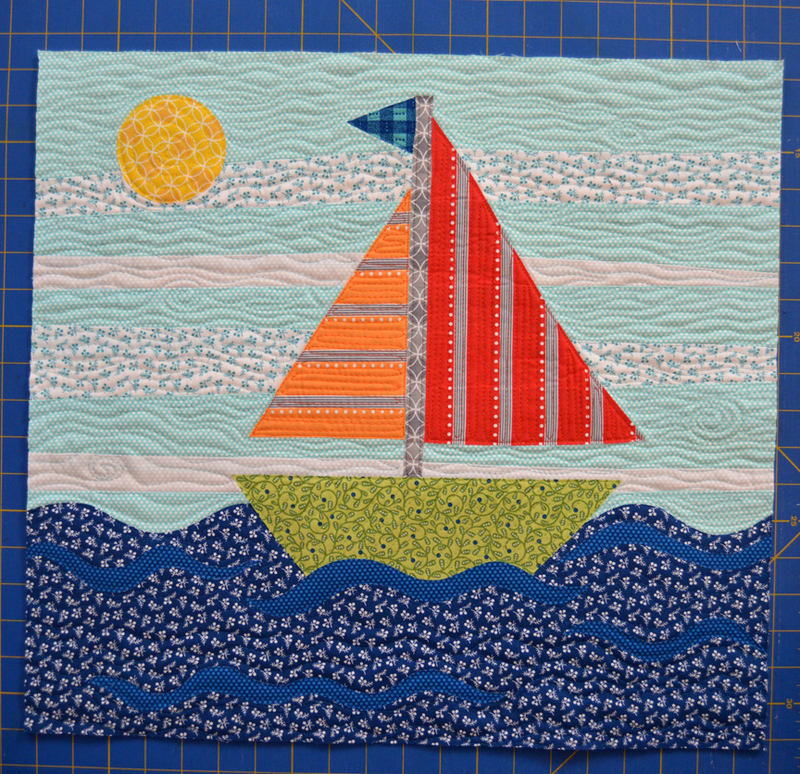 The sail boat mini is a perfect pattern for the Bree fabric! It's adorable! Summer is such a relaxing season for me...no school/no work (except for home projects). I love working in my flower gardens and getting my hands dirty! Very cute project! I love sitting outside with my kitties on my porch in the early morning coolness, watching the birds and squirrels go about their business! What a wonderful little project! Thanks for sharing the tutorial. My favorite summer activity is swimming at the beach! Cute project. Too bad I don't sail, but love to go camping. Thanks for a great giveaway! this I adorable. thanks for sharing the tutorial. 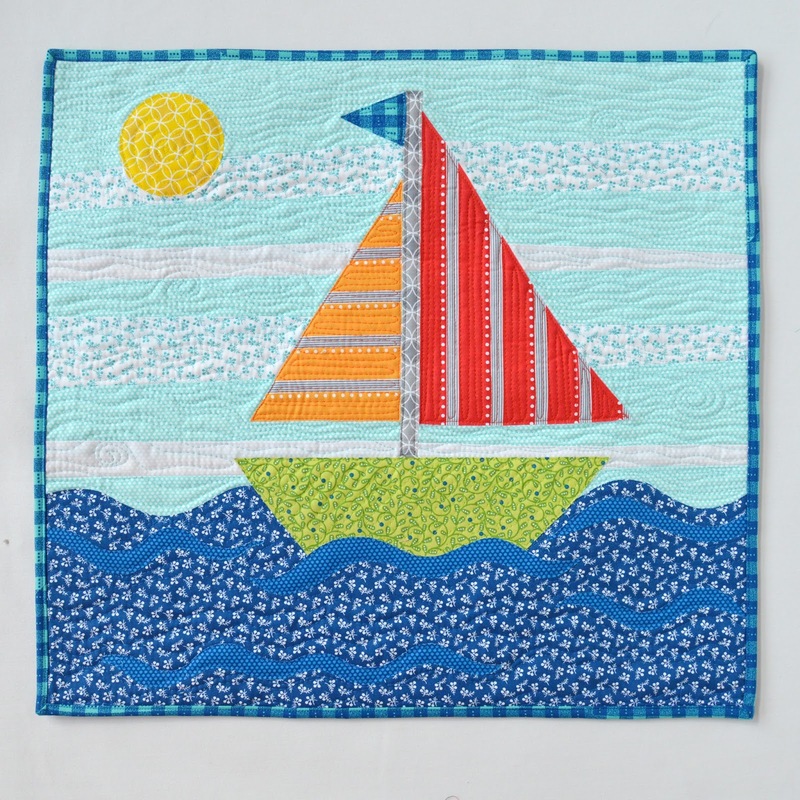 I love that this is so bright and cheerful and even more that it is quilt as you go. Thank you. My favorite activity in the summer is stitching on the porch. Enjoying flowers and garden produce--getting together with kids and grandkids. Love the wall hanging. The quilt as you go background is so much fun. I love to walk barefoot in the sand on the beach in the summer. My favorite summer activity is going on Quilt Shop Hops with my sister(s). Local fabric stores are limited in their stock, so we like to seek out others and the best way to do this is by Shop Hopping. 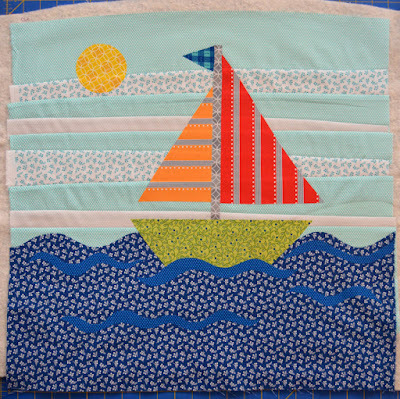 BTW, love that sailboat block. I love to take my granddaughters swimming! Reading in the backyard in the sunshine is my favorite summertime activity. 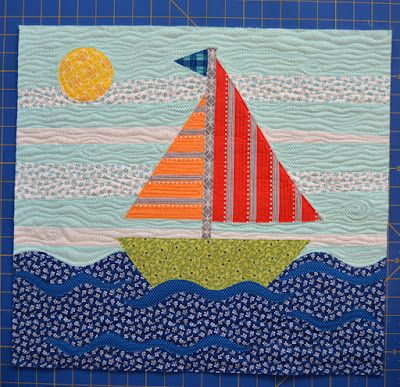 Love the sailboat block! My favorite summer activity is gardening and spending time with family. I sit out on the patio, crochet away! Watch the grass grow and the animals!! We love camping and hiking. This wall hanging would be perfect for my Grandson. Thanks so much for the tutorial. Hi,I love this little Block!We love to picnic with others! Thanks for sharing it+the Bree Blog Hop! This is so lovely! I love to swim or sit in the shadow in our garden and stitch! Aw this is really cute in these fabrics! Great sky technique. :-) I love to spend time by the lake, sinking my toes in the sand, listening to the water, watching the sun's sparkle on the waves, marvelling at the beautiful blues. I always love quilting but my more active, stay fit activities include biking, hiking, and walking. Very cute. I love going to the lake or beach, canoeing, visiting family, and picnics and cook-outs. Sitting on my front porch watching Humming birds eat. I spend most of my time inside, with the air on, sewing winter things. When it's 110 outside, think snow!! Gardening and enjoying the results are my favorite activity. 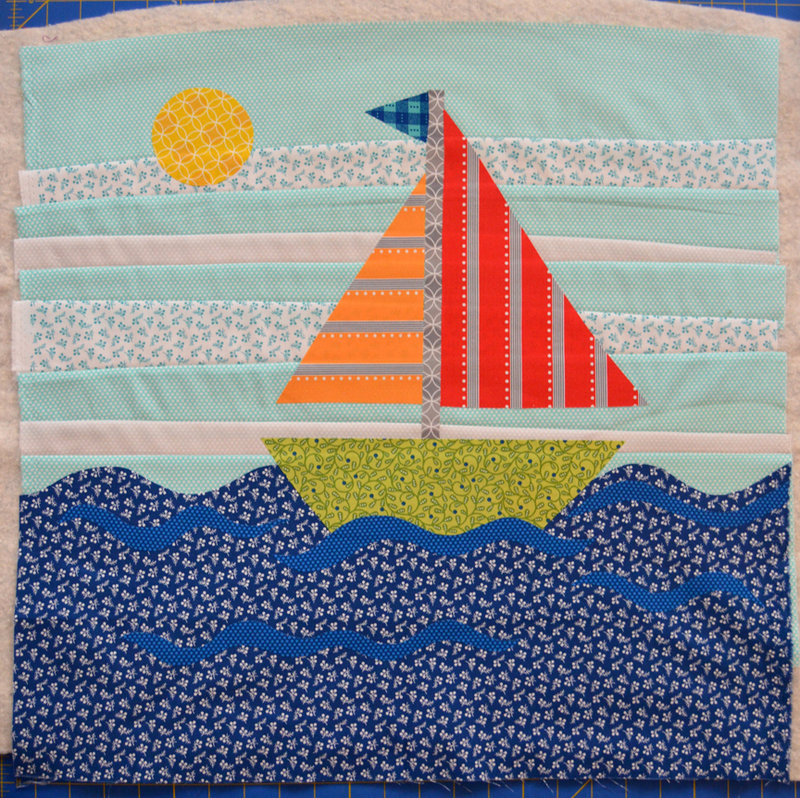 I love your sailboat quilt. Thank you. Sitting on the deck watching the waves - and stitching of course! Pretty nice.I love go to the beach and have cold coffee. Cruising in my husband's 57 Ford Fairlane convertible! Oh, that little quilt is so cute! I like hiking in the summer if it's not too hot. Sometimes the mountains and/or woods are so much cooler than other places. My favorite summer activity is walking on the beach with my hubby. I also love to get a little sewing done in the summer. The wall hanging is really cute and it looks like it would be fun to make. My favourite summer activity is gardening. My favorite summer activity is swimming at the pool with my grandkids. And sewing in the AC! So adorable! I'd like to do a bunch for a quilt. Friends who live on a boat just had a baby and this would be an adorable gift! 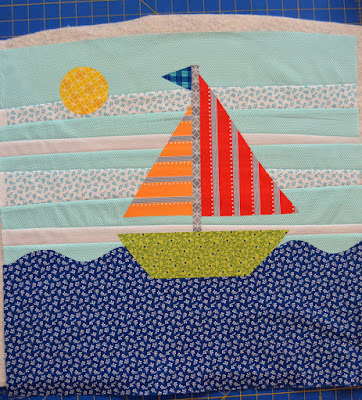 My favorite summer fun is working in my sewing room...as if you hadn't guessed it already. Bicycle riding and going to the local farmer's markets. Your little wall hanging is adorable! Thanks for the tutorial. What a cute mini! My favorite summer activity is sewing in my sewing room, which is much cooler than the rest of the house. I like to garden in the morning and when it's hot go back inside and sew! I like going to relative's pool and enjoying it with family. Sweet little project. Thank you for the tutorial. I like to hand quilt on my front porch during the summer. That is such a cute project! My favorite thing to do in the summer is sit on my deck and read (as long as the bugs aren't too bad). Riding my bike, swimming, reading, sewing. Can't have just one! I look forward to going to the Adirondacks and spending a week with friends, going on boat rides, and talking (no cell phones, just good conversation). I also enjoy going to the lake and watching the sunsets with my husband and pups. Thank you for the inspiration and the chance to win this beautiful fabric. That is a cute wall hanging. My favorite thing to do during Summer is traveling visiting friends and family. There are driving trips, flying trips, cruising trips, stay at home and visit trips.... I enjoy them all. Besides cookouts, we enjoy going to all the fairs and festivals. I enjoy flying with my husband in our small airplane. Thanks for the great tutorial for this cute wall hanging. My favorite summer activity is getting outside to play disc golf. Favorite summer activity is swimming. Thanks for the chance, this is such a cute line of fabric. Love this line of fabric!! Favorite summer activity is haying season and raking the hay. My favorite summer activity is going to garage sales. There aren't many in spring or fall, so that makes the summer ones special! I mostly like to stay in where the AC is cool, but I have been revamping my sewing room hoping to make it a more productive place. It's gets very hot and humid here in Louisiana! My favorite summer activity is working in my gardens. But if it's too hot for that, I'll be reading a book in the shade. My favorite summer activity is going to the beach, looking for rocks/shells and reading a book! Love your wall hanging. My favorite summer acitivity is tending to my roses. They are so beautiful and I love all of the different colors and smells they produce. We love watching the stars. This is a darling quilt! That is so cute. It would make a great pillow. I love just sitting outside in the evenings and listening to the night sounds of summer. With my bug repellent on. We enjoy sitting on our back porch, watching the birds, butterflies, and the antics of our feral kittens. Looking out the window when I'm sewing and watching the birds and deer (not antelope) play. Oh and a few ground hogs that climb the trees. This wall hanging would look great at our lake cabin! My favorite summer activities are golfing and boating. Thanks! Fried green tomatoes, BBQ and family cookouts!! Thank you!